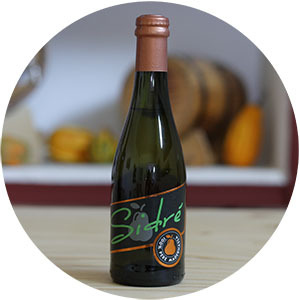 Sidré is the first and only Madernassa pear cider. Madernassa is a typical pear variety from Roero; a pear with a hard pulp, that is compact, slightly juicy and ideal for cooked preparations. Originally from the town of Guarene, roughly a century and a half ago in the locality that bears the same name, the Madernassa pear is still quite unknown. Despite its excellent quality, it has remained confined to more exclusive productions. This fizzy beverage, dry and with a low-alcoholic content, is much more like a sparkling brut wine as opposed to classic French and English ciders. 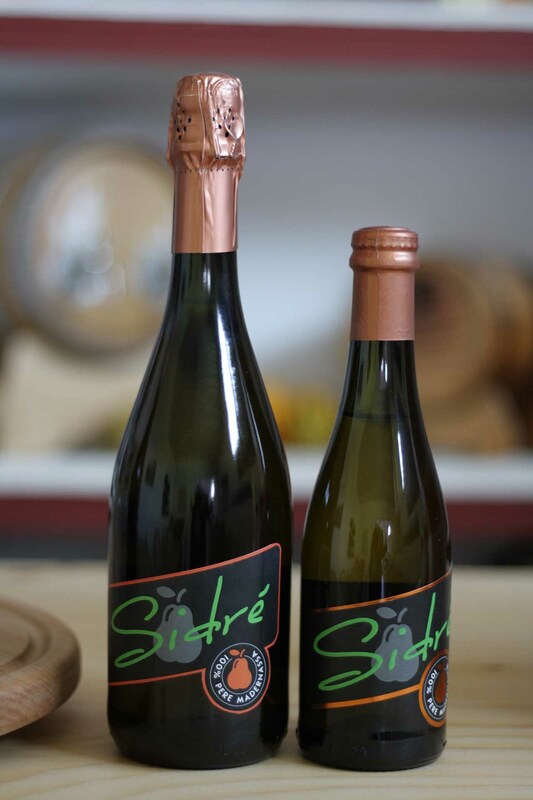 The Sidré cider originates precisely with the intent of enhancing the variety of Madernassa pears, an autochthonous and typical Roero product. I was at the Guarene town feast with friends and as we were chatting we ended up talking about artisan beers and apple cider. So, what started out as kidding around became rather serious and a few months later we produced the first bottles of Sidré. When we began producing the cider, we thought of combining Italian oenology and beer brewing. The first “experiment” was carried out following the Classical Method of the Great French Champagnes with froth in the bottle, as is the case with craft beers. We fermented the juice in glass, through the use of selected yeasts, and let it rest for a few months. The result wasn’t bad at all: we liked Sidré right after the first sip. However, there was an aftertaste of yeast due to the problems during the boiling, the process used to eliminate the residual yeast present at the end of the disgorgement process. Normally, Champagne and Classic Sparkling Method producers use a costly machine that, by instant bottleneck freezing, allows for complete extraction of the lees. Given our small experimental production we had to fall back on a more “homemade” solution, using the home freezer. The result was good, but not quite refined enough for sale to the public. This is why, for the official production of Sidrè which began in 2014, we chose to follow the Charmat method with fermentation in autoclaves. Given the success of our pear cider and the experience gained over the years, we are thinking of going back to the froth in the bottle idea, which would give Sidré a finer perlage and a more elegant taste. Another important choice to make in order to highlight this idea was the name: we asked ourselves “how to summarize in a single word the concept of cider, giving the right importance to the Madernassa pear and the territory in which it grows?”. Starting from this consideration, and after several attempts, we found the perfect name: Sidré. In addition to clearly referring to cider, the word Sidrè follows the expression in Piedmontese dialect “si drè”, which means “back here“. 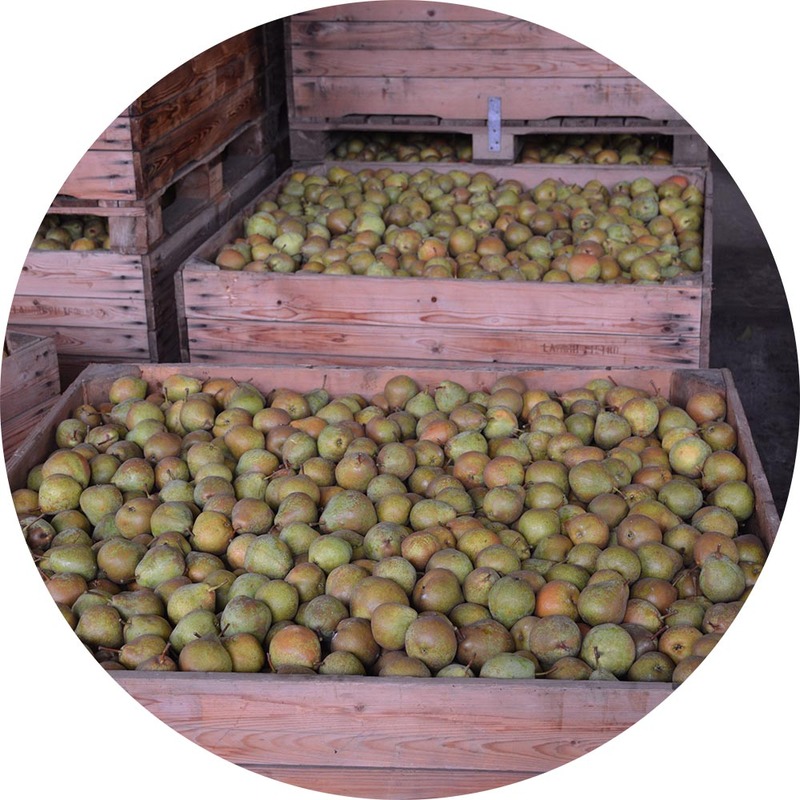 The pears need to reach the right level of maturation, which gives them a good sugar content and a low acidity. They then go to the mill, where they are chopped in the press in order to extract the juice. The yield is quite low due to the Madernassa pear’s hard and slightly juicy pulp. We follow the Charmat method when it comes to fermentation; it’s carried out in an autoclave, at a controlled temperature. Only selected yeasts are used. Before proceeding with the second fermentation, the product is clarified and filtered. The Sidré is then ready to be bottled and served in your glasses. Ours is a sparkling dry product, slightly sweet, which can be savored throughout the entire meal, from the appetizer right up to the sweet. Sidré Cider is a certified gluten-free, low sulfur product and suitable for a vegan diet. The Sidré is a sparkling, dry and low-alcohol content beverage. It has an intense, straw yellow color with golden reflections. The aroma is fruity and its taste is fresh and pleasant. The low alcohol content and the marked effervescence make Sidré a product that is greatly appreciated by the female palate. It’s ideal as an aperitif and it’s also suitable for accompanying starters and simple dishes such as fish, white meats or vegetables. Great as a drink for an evening at the disco or lounge bar, it also goes really well with pizza. Do you want to taste our Pear Cider Sidré? Buy it on ShopLanghe and get it directly to your home! The shipment of 6 bottles is free throughout Italy.